7) I'm still steadily working on the water at the moment. It's a matter of adding slowly. I need a very gradual effect and this wont be achieved by rushing it. You can see here I've started laying in the basis of the rocks. I was going to hold off on this a little but I started getting a little lost in the water and worrying about loosing the unity of the piece, so I've decided to play around with the other tone values so I don't risk mucking up the water. It's important to me that all aspects of a picture feel 'married' to each other. By that I mean each piece/component of a picture feels like it belongs to the others. Not one thing stands out like a sore thumb in comparison to it's surroundings. No one thing looks out of place. There are several ways to do this and we might have a look at that topic in a Pyro Newsletter very shortly. So far I have been reasonably pleased with the progress of Platypus, until I struck a physical problem...one I have not come across often before. A 'bloom' has spread over some of the more heavily burnt water sections. Mostly this has happened on the heart section of the wood, which wasn't quite as dry as the rest of the timber. It's like the sap is oxidising. I'm not horribly concerned as it wipes away with a dry cloth and feel once a sealer is on, it will no longer form. I have tried a little turps and metho on the bloom, but it comes back just the same. 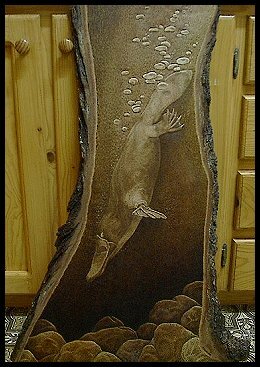 8) Okay, in real life Platypus Diving is just about to finish. Today is the last day I'm working on him, but you will continue to see his progress for a few more diary entries yet to come. In this picture you can see I've been continuing to work on the rocks, creating texture and a feeling of distance as I move around. The water is very close to being finished but I continue to adjust and balance this as the piece progresses. It's still vital that platypus doesn't feel like he's suspended in black. Of course, except for the large bubbles, there isn't much feeling of movement yet. This is another vital element in making a piece realistic but that will come a little later with the fun finishing touches...the work that makes the platypus breath. You can see I've started working on the body tone. I will continue to work this off and one for quite some time. The bubbles haven't been touched yet but is next in line because I am concerned I will lose balance in the piece if I don't get a feeling of how they will look when burnt. First I have to study bubbles to do this. I'll fill a bath and have a play to see how they look...the shadows they caste and so forth. I'm concerned the bubbles will stand out too much and detract from the main subject, so I have to be careful not to let the eye to stay up top. The objective is for the eye to travel down the platypus to the far bottom corner of the river bed. For this I'll have to keep the rocks in that corner lighter and not have the bubbles outweigh them. I'm off to do the Melbourne Wood Show in the next few days so the diary will have to be finished after that. 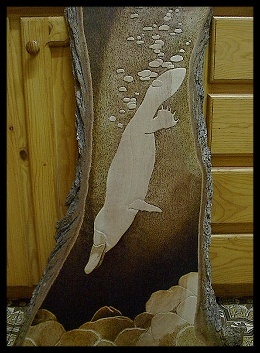 All going well, 'Platypus Diving' should be competing in the Australian Woodworking Championship at the show. Come along and have a look if you get a moment. 9) Only 3 more steps to look at in this visual diary. A lot has been happening since the last step. I have added more to the water to smooth it out and create more depth. I have also added more darkness under the back and front flippers. I have continually added to the rocks to give them depth and texture and to make the back rocks appear to recede. I have started to add the shadows to the bubbles, really at this stage to get a feel of how they will look and balance with the other elements in the piece. As you can see, I've been working quite a lot on the platypus itself, especially on the lower part. I'm trying to create a feeling of his head going deeper into the darkness of the river while his top half is being illuminated by the surface light. I've also started adding some bubble shadows to the til to create a 3D effect. This helps the bubbles 'come alive' and of another level from the platypus. It also gives them a feeling of movement and of floating. 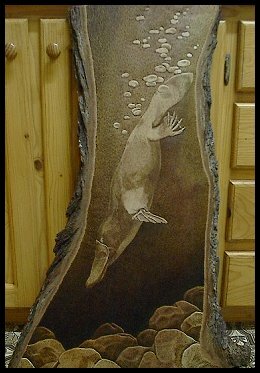 10) Much of this stage has been spent filling out and adding to the body of the platypus and the rocks. I was unhappy with the tone at the tops left water, so decided to scrape away a little to improve the balance of the water. You can see the bubble shadows have been darkend and the platypus body has been filled in a in more, especially the back half/tail and the front leg. The front fliper has also been added to, burning the creases darker to give a sense of shadow and depth. The rocks have been worked on again. I have been constantly adding to them to give a feeling of not only shape, but of depth also. 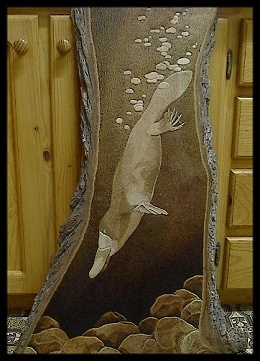 The one other thing I have added to this stage are the tiny bubble trails coming from the Platypus's coat. 11) Finally, the end! :) Well...all apart from the varnishing that is. This has been a long project, but certainly and enjoyable one for the most part. There were some stages that got a little boring, but most pieces have some portion of this. To combat this, I tend to flit around my work so I don't get too hung up or frustrated. 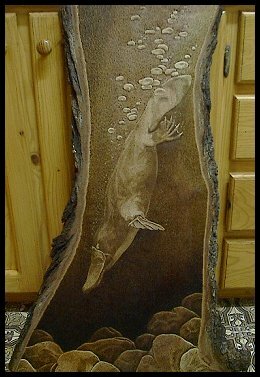 You can see I have finished adding to the body of platypus, trying to keep in mind the play of bubble shadows on the coat. I have also added a lot more depth to the coat and the head area. The bubbles were also added to for more definition. The rocks drove me a little insane and I feel I could have added to them, but I had had enough and decided to stop. All in all I'm reasonably happy. I feel some definition was lost, but this is the nature of Grevillea robusta, (silky oak). I will certainly be playing about with this timber again. 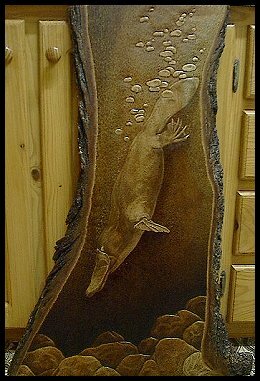 I still have a wonderful slab left and already have some pictures in my head of what I can do with it. The see other visual diaries, please click below.